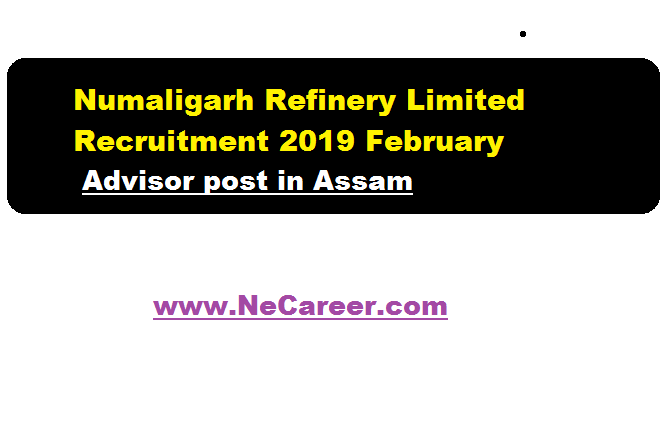 Numaligarh Refinery Limited Recruitment 2019 February :- Hello dear job seekers. Welcome back to North East India's No. 1 Job Portal NeCareer . A new vacancy in the state of Assam will be discussed today .Numaligarh Refinery Limited (NRL), a leading Miniratna Category- I PSU plans to lay Crude Oil and Product Pipelines in the states of Assam, West Bengal and Odisha having a total pipeline length of over 2,000 KMs. The company intends to engage persons having minimum 15 years of experience in Pipeline Projects, on contractual basis, as Advisor. The details of the recruitment is mentioned below. Educational Qualification: Candidates must have Minimum Bachelor Degree in Engineering from a Govt recognized institution/ university. Experience: Having minimum 15 years of experiences in pipeline projects. Age: Should not be more than 65 year as on 01.02.2019. Remuneration : As per Industry practice. Interested and eligible candidates may apply with detail Bio-data to the following address on or before 21st February, 2019, superscribing the envelop “Application for the post of Advisor (Pipeline Projects)” on or before 21st February,2019. Shortlisted candidates will be called for interview for further evaluation.